Diana Chou is the first woman to sell private aircraft in the Asia region. Chou established Sino Private Aviation Limited in 1999, and was committed to the market promotion and sales of business jet aviation services in the Greater China region, which has been in service 18 years. The company has been the official agent for Bombardier business aircraft in greater China for 15 years. During these 15 years, Chou has aided the development and growth of this company and has witnessed Bombardier business aircraft expand from just several aircraft to several hundred in the Greater China market. Chou focuses on delivering perfect private flight services to her customers, as well as providing flight solutions according to their demands. Accompanying the constant rise of general aviation markets within the country, Chou established Aerochine Aviation Limited (also known as Aerochine), and as the official agent for Bell Helicopters (now known as Bell Flight), she has opened up the market business in the southern part of Greater China. At the end of 2014, Aerochine established an aviation service center in Ningbo, and in the following year established the first global leading rotorcraft Maintenance and Repairs Operation Base (MRO) in Zhenjiang Aerospace Industry park, located in Jiangsu Province, expanding their business domain to include helicopter maintenance services. In September of 2016, the Aerochine Zhenjiang MRO obtained the maintenance qualification permit for the CCAR-145 unit of the CAAC, and in November of that year was appointed the authorized customer service center (CSF) by Bell Flight. Many years of hard work have earned Chou an impressive reputation in the aviation industry. Sino Private Aviation and Aerochine were both awarded the title of “Best Agent of the Year” separately in 2014 and 2015, by the China Flight Club of U-Jet magazine. In the process of conducting business jet sales, Choucame across many clients who have not yet purchased any business jets but are still in need of charter flights, while a portion of the clients who have already bought business jets are willing to charter out their excess flight hours. To resolve these customer demands and to build a professional brand belonging solely to herself, Chou established L’VOYAGE Ltd (also known as L’VOYAGE) to offer business jet chartering services, providing her customers comprehensive and customized private flight solutions as well as bespoke travel experience with the concept as a business jet chartering consultancy. L’VOYAGE has since grown to be one of the charter consultation industry’s fastest growing businesses in APAC. As the first service provider authenticated through the Wyvern safety system in APAC, L’VOYAGE has continuously treated customer safety as first priority for their services. During the annual “Icons of Aviation” awards held in 2017 by the Asian Business Aviation Association, L’VOYAGE was presented with the Best Charter Agent award. In 2018, Diana Chou invested in Jet 8 which bases its operations in Asia. Jet 8 provides purchase financing and operations, serving the Asia Pacific market. From selection of models to purchase financing, Jet 8 provides its clients with professional consultation advice. The three general aviation companies operated by Chou are all under Dragon General Aviation Group Limited (or DGA). Using its sharp business senses, reliable business values, and constantly expanding business networks, the group supports the companies under it to continue their strong development, guiding the forward development trend of the general aviation industry in the Greater China region and introducing international experience and strategic cooperating relationships to regions in Mainland China, Hong Kong, and Macau. 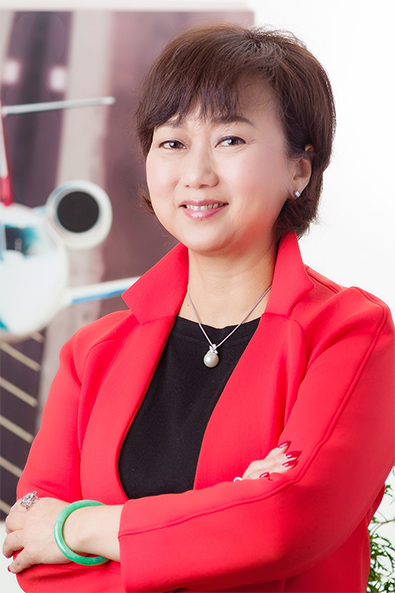 Since embarking on her entrepreneurship in 1999, Diana Chou has become a leader in the domains of Chinese public affairs and general aviation. She has always been outspoken in her advocacy for improving aviation standards, suggesting that Mainland China and Hong Kong train more pilots to meet the rising developments of Chinese general aviation. Under Chou, Aerochine cooperated with Hong Kong’s Vocational Training Council (VTC) to establish a scholarship plan to finance private pilot licenses and training projects, setting an example by personally taking part in promoting the development of the general aviation industry. As a successful woman who possesses a sense of social responsibility, Diana Chou also participates in social voluntary services with enthusiasm, supporting various fund-raising activities of many charities and non-profit groups. The Saving One Child’s Life in 28 Days program, under the United Nations Children’s Fund is one example, which actively protects children’s rights. DianaChou is a founder and board member of Asian Business Aviation Association (AsBAA), and was named Woman Leader of the Year in 2015. She is currently a member of various economic, general aviation, and public affairs groups (mentioned above) and pays close attention to market trends and economic and policy changes. In 2010 and 2012, Chou was awarded the Annual Award of 100 Outstanding Female Entrepreneurs in China. In 2013, Chou also received a professional qualification, an Academician’s degree conferred by the Canadian Charter School of Management, and earned the professional title of Concessionary Manager. Chou is also active in artistic and cultural activities, participating in activities organized by the Beijing Today Art Museum, and also acts as the director of Guo Xuehu foundation.